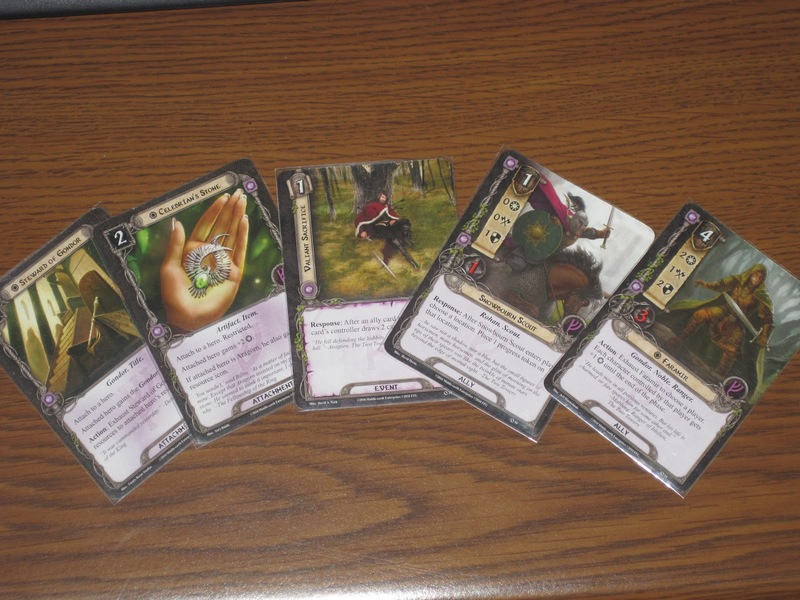 In my last post, I described my first five attempts at the Passage through Mirkwood scenario in the Lord of the Rings LCG. I’ll provide the tl;dr summary of that last post: FAILURE. After my first five failures, I tried deck-building using tactics as the backbone of a tactics/lore deck. I will briefly describe the result: MORE FAILURE. But I was not cowed. I get by with a little help from my friends. These cards were a huge boon to my successful quest. I did what any intrepid adventurer would do in my situation. I took to Twitter, not so much for advice as for moral support. I put out a call for others who had shared my misery and received several corroborating replies: no, you’re not stupid. Yes, the first scenario is somewhat difficult solo (especially if you don’t know what you’re doing). And oh, you played tactics? I received many different pieces of advice, ranging from, “Play a different game” to “play multiple decks” to “try a different sphere.” I thought trying a different sphere seemed simplest without abandoning my investment. While tactics was my preferred sphere, I decided to try leadership (mostly because I know Aragorn is a king and he must be awesome, right?). 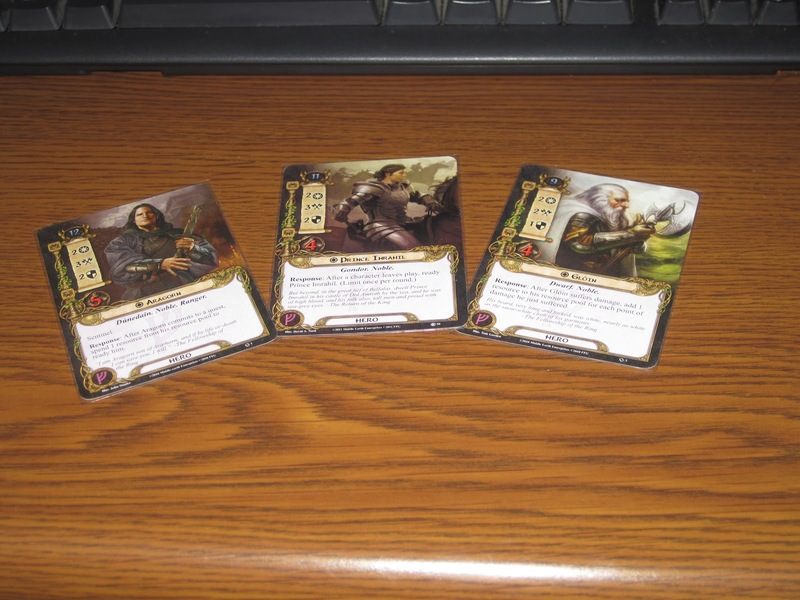 I used the starter deck included in the core set paired with the heroes Aragorn, Gloin, and Prince Imrahil (yes, I cheated a bit: Imrahil is from the Journey to Rhosgobel adventure pack). This time I won in my first try. Handily. Cash flow. Leadership is versatile, a jack-of-all-trades, master-of-none sphere. But one thing it has going on is resources. One of the struggles I had in the tactics sphere is that it felt like all the good cards were expensive and I never had the resources to spare. If I wanted to save up to play good allies or attachments, the quest would be lost and my heroes dead before I’d have an opportunity. But with leadership, many of the abilities and cards allow for not only more resources, but liquid resources. 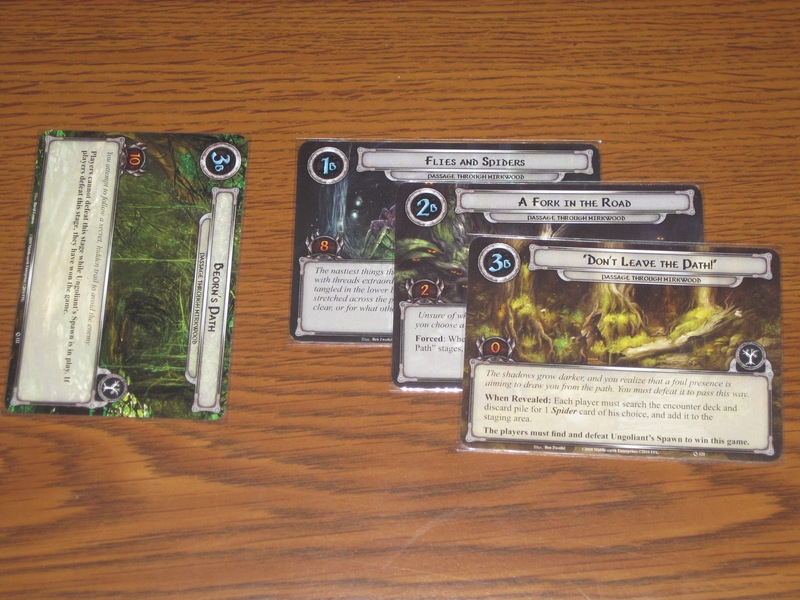 Steward of Gondor, for example, provided one hero (read: Aragorn) with two extra resources per turn. I drew this in my starting hand (thanks to two copies in the deck), and so I was able to play more cards throughout the scenario. Many of them were spider food, but it left the heroes open for what they do best: heroing. (The liquidity–allowing transferrance of resources between heroes or giving heroes multiple sphere icons–will come in handy later, particularly in the Journey Down the Anduin scenario. Versatility. I mentioned this briefly, but really, leadership is versatile. The heroes must have attended some Paul Allen company lectures or something, because they specialize in getting things done. Aragorn, by spending one resource from his pool, can quest and attack/defend. By stocking the back line with redshirts, Imrahil can pull double duty as well (he readies once per round when a character leaves play). Gloin, like the Joker, cries, “Hit me!” because when he’s hit, he gets more buying power. This team of three really kept the options open. Better use of combos. I hit on several combos this time around. First of all, Snowbourn Scout, which allows his player to place a progress token on one location when he enters play, is a cheap and easy way to keep the many locations in this scenario at bay. He costs 1 resource to play, and his stats are reflective of this, but he is a perfect choice to feed to hungry spiders. Better still, Snowbourn Scout’s inevitable demise, paired with Valiant Sacrifice’s card draws and Prince Imrahil’s readying ability, make this one of the most desirable cards to get into play. Good allies. Carrying on the theme of versatility, good allies really helped me win this game. While expensive, Faramir is an ally worth paying for. His decent defense paired with his uncharacteristically high hit points allow him to stay in play over several turns, while his high willpower and decent ability make him a worthwhile quester as well. I already detailed Snowbourn Scout. The other allies are decent (Longbeard Orc Slayer is great situationally), but in some ways overpriced. Guard of the Citadel doesn’t seem worth the cost of 2 resources generally, at least if he were in any other sphere: in leadership, the resources flow freely. Luck. I can attribute my win, finally, to a healthy dollop of luck. I drew Steward of Gondor in my first hand; Celebrian’s Stone was not far behind. This made Aragorn the king he was meant to be, giving me a four-willpower quester who was also awesome (and could participate) in battle. I hit treacheries early in the deck, making the first quest card easy to defeat. Also, because fewer cards were dying in battle, I was able to build a steady stream of frontline fodder for when some of the bigger baddies came out. This helped me focus my energies on defeating Ungoliant’s Spawn and clinching the win. I defeated all three of those cards. And yes, I did the hard one of having to fight Ungoliant’s Spawn. Journey Down the Anduin, on the other hand. That’s a different story.